James Tanner at Genealogy's Star discusses a new website, The Full Wiki on this entry and this one. I commented on the first entry explaining a few criticisms I had about the website, and I don't think I made myself clear, so I decided to provide some more details, as I agree that the website does look intriguing. But underneath, there are some serious issues. We are building the largest collection of free licensed work on the internet. We have already brought together the collective works of Wikipedia, Wikiquote, WikiTravell, Wiktionary and for nostalgia, the Encyclopedia Britannica of 1911. But at The Full Wiki you're not really searching those websites. You're going back in time and searching those websites an unidentified number of days ago. Let me show you exactly how I know this. I am not only obsessed with Genealogy. 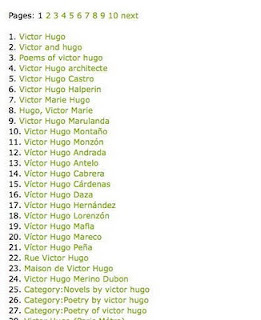 Perhaps my other single greatest obsession is the French author, Victor Hugo. I love typing his name into search engines. Since I don't usually search Wikipedia and other WikiMedia sites for genealogy information, Hugo's name was the very first name I entered into The Full Wiki's search box. A whole lot of results. But it's clear I want to follow at the first link, so I do. At first glance, you might think you're looking at the current Wikipedia page, plus a cool map of all the locations mentioned in the entry. But you aren't. Here's the current page. 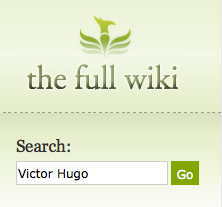 You'll notice Victor Hugo's full name on the current Wikipedia page is Victor-Marie Hugo. That's his correct name. It is NOT Victor-Mariana Clemencia Hugo, though that is what the text at The Full Wiki says. It took a bit of research in the history section of the Wikipedia page, but that is a bit of vandalism that appeared on the entry from November 24 to December 10th of 2009. So the snapshot of the Victor Hugo entry is somewhere between 1 month and 2 months old. How old are the other entries? I have no clue. There's no way to tell on the website, as they don't tell you anywhere. I don't blame them. Would you tell your potential users that the content on your site -- content that is a copy of websites that are in constant change -- is over a month old? I can not correct this error at The Full Wiki. There is no Edit tab. All I can do is wait for The Full Wiki to take another snapshot of the entry at Wikipedia that has been correct for over a month now. When will this be? Tomorrow? A week, month, year from now? I have no clue. And when they take another snapshot, will that snapshot have something else wrong with it? Maybe something that lasted only a couple seconds, but will last much longer than that at The Full Wiki. On Wikipedia you can go to the History tab and see what the page looked like at what date. You can find out how long information has existed on the page. Besides source citations, this is your best clue about the accuracy of the information. But you can't do that at The Full Wiki. Did their robotic scripts take a picture of the entry you are researching at the wrong moment, right after someone vandalised it? Vandalism is common on Wikipedia, but it usually lasts a relatively short time. Minutes, maybe hours. (It is rare for it to last as long as the vandalism on the Victor Hugo entry appears to have.) But The Full Wiki is freezing entries in a moment of time, and that means it's freezing the vandalism too. The Full Wiki copyright notice does provide a link to the orignal entry at the bottom of the page. But it's not very noticeable, and nowhere does it say how old their snapshot is. I suspect few people would assume it was over a month old. If someone doesn't know that what they are looking at is old, they have no reason to check out the current version. For this reason, I don't see much of an advantage to conducting most research at The Full Wiki, or supporting the concept. Especially when you can create a Google Custom Search Engine that will search all five of these websites (and likely any other websites they add in the future) And these search results WILL take you to the current pages. There is one, and only one thing that I can see that it does well. The Full Wiki is a product of NationMaster, and NationMaster seems to be an excellent site for comparing statistics about countries. They are promoting The Full Wiki as a mashup of Wikipedia and Google Maps. This mashup might be useful. For example, when you are reading the entry on Victor Hugo you can visually see where France is. In case you didn't know where France is. I think we can trust this information too, as the location of France doesn't change much over time. Oh...one more criticism...because I can't resist. Read the indented quote at the top of this entry. I didn't make any changes from the text on the website. It really does say WikiTravell with two 'l's. And the link is a broken one. Really good observations. I put a link to your site on my most recent additional comments. I guess The Full Wiki seems like a good idea at first. But your comments show that unless those limitations are overcome, the site would be less than useful. Thanks for the heads up. Tamura -- I like your term, wicopydia. From your entry last July where you seem to have coined the term (or at least it doesn't appear anywhere else before then according to Google) TheFullWiki concept is very similar to the WorldHistory concept. (Combining Wikipedia with Google Maps) They just took it a step further by adding a few other Wiki sites. Thanks for your thoughts and comments on The Full Wiki. All comments, bad and good, help us improve the user experience. Some more easy than others (the second l on Wiki Travel is already fixed :)). Perfectly valid point about recency. We've known that's important from the start. Remember it is a beta. I've only spent about a day in total talking about it publicly since it's been put live. The first order of the business was to provide a reason to come to the site. A straight-out mirror of Wikipedia is not useful to anyone, even if it's live. We do actually link back to the Wikipedia article on each page. In the footer if you click on "Wikipedia article" you'll see that. Our Victor Hugo map does go a little beyond just the location of France. There are about 30 locations marked on the map. I do have a tendency to use sarcasm at times. You are definitely correct that there are several other geographical locations mentioned in the entry. There's an article on NationMaster.com suggesting you announced you were working on it back in April of 2009, so I didn't realize it was put live a day ago. May I make the suggestion that before it leaves beta, that you add to the footer a datestamp of how old the content is. That should give the user an idea whether or not they need to follow the link to the original.